Kudos to Travis & Sam for planning a perfect Peruvian Welcome Party! We arrived to this amazing mansion overlooking Cusco and of course a llama was chillin’ n waiting to greet us. (Cuz, llamas are a thing here) And the path was lit by torches. The mansion had an incredible view, a draw bridge, impressive rooms with Peruvian style decor, a church adjacent to the house, a sweet little fire pit, etc. All great vibes at the party last night! El Prado is a popular, tourist-y type of main drag in La Paz. My hotel, Hotel Copacabana is right in the heart of it. 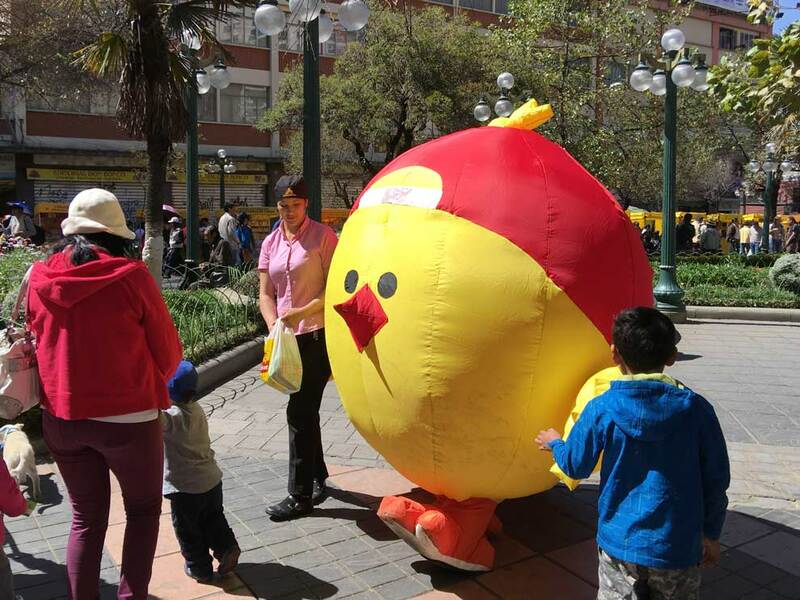 On Sundays, they have these art-walk type parties called Feria Dominical Del Prado, with live music, arts & fun things for kids like big chickens!